The litter box cabinet provides a stress-free litter experience for you and your cat. You’ll enjoy the benefit of not having to clean it often since it will clean and scoop the litter box for weeks on its own. That means less time cleaning and more time playing. Let’s break down how it works: first, your cat enters and does its business; then the self-cleaning automatic brake system cleans the entire box 20 minutes after your cat has done their duty. You can choose a faster clean up time with the ultra litter box since it has the option to clean up after 5 10 or 20 minutes. There’s even a safety sensor that automatically resets the rake timer when it senses another kitty – safety first! One important thing you need to keep in mind is that this self-cleaning cat litter box must be placed near an electrical outlet since it needs to be constantly plugged in for it to work. Once the rake system collects any waste, the automatic litter box will scrape it into a separate and closed waste compartment. The ultra option even comes with this privacy hood so your kitty can do its business in a calm and comfortable environment. This covered cat litter box uses premium blue or die-free crystals that absorb urine and provides great odor control. Its low tracking texture doesn’t stick to your cat’s paws, and it’s 99.9% dust free. There are also purple crystals available which are lavender scented. 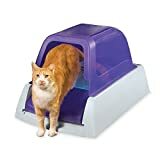 The best part about this litter box is that it uses disposable litter boxes that last up to 30 days for a single cat, and when it’s time to change the pan just close the box and toss it away. That’s it! You won’t need to scoop or sift the litter box ever again. The pan is just so easy to replace; you can buy either a single litter box replacement or a whole pack of them. Just insert the replacement, and you’re done. Having an automatic self-cleaning litter box is great if you’re going on a holiday trip. You won’t get back to a litter box full of unpleasant “surprises” that have your house smelling awful. So, how often do you have to replace your crystals if you have multiple cats? The recommended time frame is 20 to 30 days for one single cat, 10 to 15 days for a couple of cats, and 7 to 10 days for three cats. Of course, it all depends on your cat’s health, weight, and diet. If your kitten six months of age or younger it is better to leave the unit unplugged to avoid any risks.